Happy Wednesday! I am a week slow, but I did the sketch challenge finally. I've been thinking about it all week. The card is a 5x5. I got this designer paper from American Crafts at Hobby Lobby and have been wanting to use it. I used the 1 1/4" square punch and layered it with the 1 3/8" square of Choc Chip, they are then layered on River Rock. 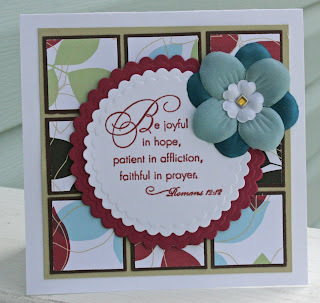 The bible verse is a retired set from Stampin' Up!, Elegant Inspirations, I stamped it with Versa Mark and then embossed with Sparkle n Sprinkles' Cordial Cherry EP. Of course I used my new circle Nestibilities. The verse is layered on Purely Pomegrante. The card base is white. I used the Pretties set of silk flowers. For the base flower I layed the flower on the Taken with Teal classic ink pad and brayered over it. For the second flower I did the same thing with the Soft Sky. I used a Fire Rhinestone Brad for the center. On this card I used the largest of the square Nestibilities and folded the paper and cut the scallop on the edge of the fold. I wanted to use one of my favorite retiring set A Touch of Nature. I think this is an all around good set. I have used it for everything...even Christmas cards. 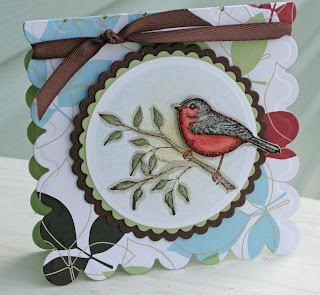 I am sad to see it go:( First I stamped the bird with Brown Stazon, then I cut the circle Nestibilitie out of white and before I lifted the die I sponged Soft Sky on it. I also stamped the bird on watercolor paper. I used the re-inkers and blender pen to color the circle. I used the Sahara Sand and outlined everything to make it stand out more. On the watercolor paper I used the re-inkers and aqua painter, then I cut it out and pressed it down on the Versamark and clear embossed it, that really makes the colors pop more. I adhered the bird on top with a dimensional. The scalloped circles are Certainly Celery and Choc Chip. On the inside I used the Refuge and Strength stamp set from Stampin' Up! I embossed it with Cordial Cherry EP and stamped the twig with Certainly Celery. The ribbon is the Choc Chip twill that was in the Summer Mini.